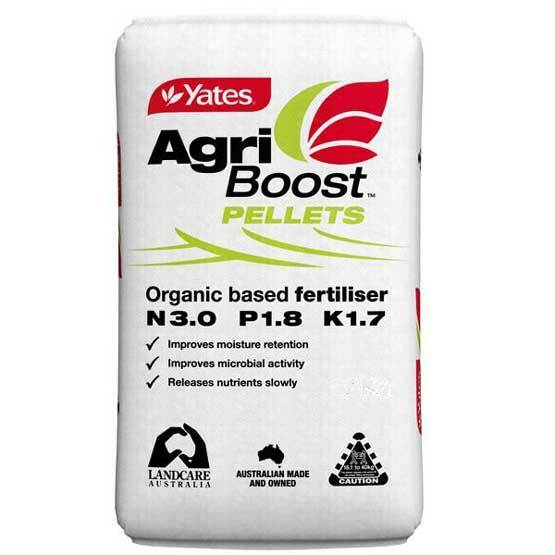 Agri Boost Pellets 1000 Kg Bulk Bag : BCSands Online Shop - Building and Landscape Supplies, we supply Sydney's best! Dynamic Lifter is composted poultry manure with a neutral pH. The pelletised formulation makes uniform spreading easier and more efficient and supplies nutrients more slowly. It is a a natural slow release fertiliser which improves soil organic matter content and increases soil water holding capacity. Dynamic Lifter also improves soil structure and enhances the soils cation exchange capacity which facilitates greater nutrient retention. The nutrient level of Dynamic Lifter is consistent and guaranteed; the nitrogen, phosphorus and potassium levels are higher in Dynamic Lifter than in raw poultry manure. Dynamic Lifter has been heat treated, which kills weed seeds and significantly reduces harmful bacteria. Easier to spread than raw manure with a more consistent result. There is minimal chance of burning or leaching with Dynamic Lifter. Dynamic Lifter Standard Products are certified 100% organic fertiliser and quality assured.